Continuing to find the stranger places in Knoxville, your intrepid correspondent has brought you his latest post-lunch walk. Magnolia Ave. has many faces, going from old suburbia to downright ghetto, but when it collides with Interstate 40 and the northern section of downtown, it gets funky. The recent interstate expansion has literally cantilevered itself over the old boulevard, giving this block a Chicago "L" kind of feel. 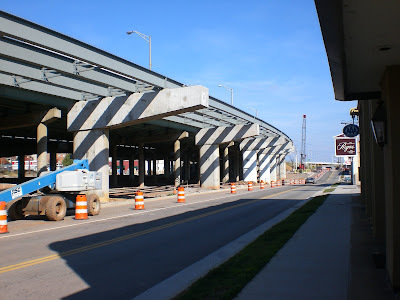 Despite the fact of facing a no man's land under the overpass, several businesses thrive on the other side of the street. 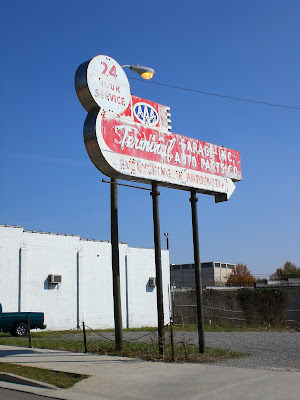 An auto repair shop, a print shop, one of Knoxville's oldest and "classiest" restaurants- Regas, and an indie art gallery anchor one end of the block. But my favorite two places are right in the middle. 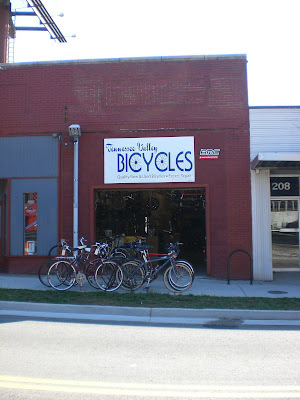 Tennessee Valley Bicycles is where all the cool downtown commuting crowd goes to get repairs. These guys are honest and won't make you feel inferior if you aren't a biking god clocking in 50 miles a day. They just like like riding and actively promote it in Knoxville, as evidenced by the "Booze and Cruise" every Wednesday. It's basically a pub crawl with bikes involved. 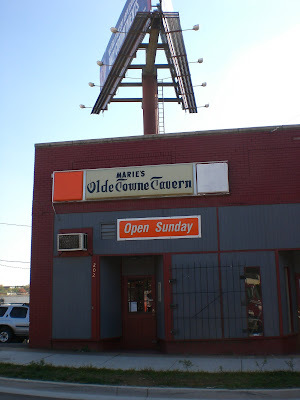 The cruise usually ends up at my next favorite place on the block- Marie's Olde Towne Tavern. I first noticed this place a few years ago when I was walking down Central. I thought it was just an old sign with no business inside. But sure enough, it's there and thriving. Marie's was a downtown bar long before it was cool to be a downtown bar. It'll probably be there long after all the trendy bars shut down. It reminds me of a place Suttree would go, on the fringes of town, where if you're going there they probably know your name when you walk in. So here, for yr consideration, is the 300 and 400 blocks of Magnolia Ave. 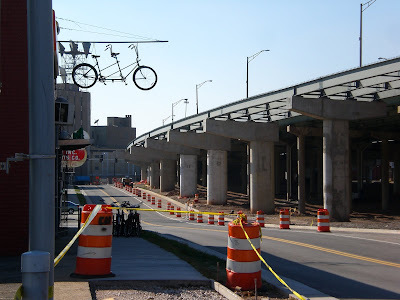 If you pride yourself as an urban Knoxvillian, or are a visitor looking the "real" Knoxtown, you owe it to yourself to explore and support this scruffy edge of downtown. chris, we should do a tour of magnolia on the other side of the highway...go to chandlers, get some mac and cheese...YUM! do you do the booze cruise? i have always wanted to but have yet to partake. not yet, but i want to. apparently it was voted knoxville's "most questionable sport" by the knoxville voice. marie's should be the new hang out. and chandler's is the best- gotta get that soulfood every now and then. chris, i nominate me and you to do the booze cruise and document it to put on this blog. and then we all need to go to chandlers fo real. i love your suttree remark, by the way. we need to send a copy of that to will so he can read it. that book is so, so, so good. and i can't wait to see no country for old men! !